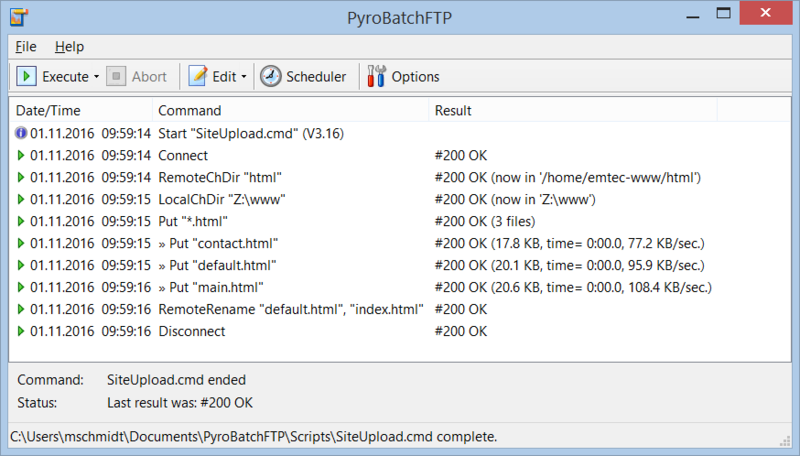 PyroBatchFTP • Automated FTP/SFTP/FTPS File Transfer via Batch/Script. PyroBatchFTP is a Windows software that lets you exchange files with FTP, FTPS or SFTP servers in an automatic and unattended way, using a simple yet powerful batch/script language. In the window above you can see how to automate a file transfer using only a few simple commands (sample scripts). Automating your transfers is as easy as putting these commands into a script file and running it either from the toolbar or from an icon on your desktop or from the built in scheduler. PyroBatchFTP is a software for automated file transfer via FTP and SSH/SFTP and SSL/FTPS. The program allows users and software developers to write scripts to perform fully automated file transfers. The scripts can be scheduled to run and will then transmit files to and from other computers which run a standard ftp or SSH server. Beyond the script language, PyroBatchFTP features a DDE interface and logging functions, which allow other software to determine the success and flow of each of the script commands. It also offers email functions, which can be used to alert a system administrator in case of network problems or other situations when the file transfers fail. There are two versions of PyroBatchFTP, the Standard Edition and the Server Edition. It depends on your use case which one is right for you (both have the same price and when you license the software, you can use either one). The Standard Edition can also schedule PyroBatchFTP jobs, but will only run them while the PyroBatchFTP is kept active for a logged in user. The Server Edition installs itself as a Windows background service and it will continue to run scheduled jobs in the background even if no user is logged into the PC (this is typical for server machines). Which should you use? You can try both (the price is the same and the license will work for either), but the Standard Edition is probably the better one to get started. If you find it too limited because your focus is on running scheduled file transfers on a computer where no user is logged in, you can still install the Server Edition instead. You will find both versions in our download area. Connect -f "webserver.emtec.com", "username", "password"
Local and remote file manipulation, like download, upload, move, rename, delete, etc.